Home » About Us » Our Physicians » Nilesh J. Patel, M.D., F.A.A.O.S. Dr. Nilesh Patel graduated from Stevens Institute of Technology and was elected to the Alpha Epsilon Delta premedical honor society. He earned his medical degree from the University of Medicine and Dentistry of New Jersey, where he was inducted into Alpha Omega Alpha medical honor society. He completed his General Surgery internship and Orthopaedic Surgery residency at the State University of New York, health sciences center at Brooklyn, New York. 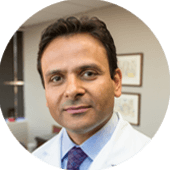 Dr Patel received his subspecialty training in foot and ankle reconstructive surgery at the University of Pittsburgh Medical Center. He has made numerous clinical presentations detailing basic science and Orthopaedic Surgery research. After completing ten years of medical training after college, Dr Patel joined Edison-Metuchen Orthopaedic Group in 2003. He has active interest and expertise in general Orthopaedic Surgery, Arthroscopic and Joint Reconstructive Surgery with special interest in lower extremity disorders including foot and ankle disorders. Dr Patel is a Diplomat of the American Board of Orthopaedic Surgery. He is a fellow of the American Academy of Orthopaedic Surgeons and is an active member of the New Jersey Orthopaedic Society.